Categories: Blog. Tags: News, Training. The topics we cover during our workflow training can be divided broadly into two areas: file organisation and quality of output. For most of the photographers we train, pro and advanced amateur, the two areas are equally important but online, there’s relatively little information about keeping your stuff organised so we’ll be attempting to help remedy that this year, beginning with the topic of keywording. A few tips can help you organise your photographs and find them when you need them so we’ll be providing short blog posts on that topic and others relating to organisation of your image library. Although they’ll be based on Lightroom 3, some of the tips will be apply to other digital asset management applications as well. Most of what we do is one-to-one training but we’ve been collecting names from photographers who’ve written or called to ask about attending a class. If you’re waiting for our next Lightroom training course in London, please e-mail or use the contact form and we’ll measure interest and write to all the people on our list well in advance of our next course. We might even end up putting out a quick questionnaire to ask if the photographers who’ve subscribed to our blog would prefer week-end or week day courses. As usual, follow the blog by e-mail or RSS and you’ll know when we get something ready. A rewrite. We’ve had a copywriter look over the site and rewrite the copy and we’ve also sketched out a plan to make the whole place a little more streamlined and easier to navigate, with more information about us and a little less clutter but the changes aren’t live yet. You’ll see them roll in gradually over the next few weeks. There may be the odd broken link while that happens—if you spot anything, please let us know. Shoot Raw moves to Dreamhost. We moved our web hosting to Dreamhost recently, since we host several sites and have recently been helping photographers with their own online presence; Dreamhost makes that a bit easier for us, without the need to worry about bandwidth or hosting fees. We made the move during what we thought would be a very quiet time but some of you noticed the disruption while looking for contact details for us online. Apologies for the inconvenience. Earlier this year, I taught a unit at Ravensbourne, previously known as Ravensbourne College of Design and Communication. The college was based in Chislehurst but now occupies a fantastic new building overlooking the O2 Arena on the Greenwich Peninsula. 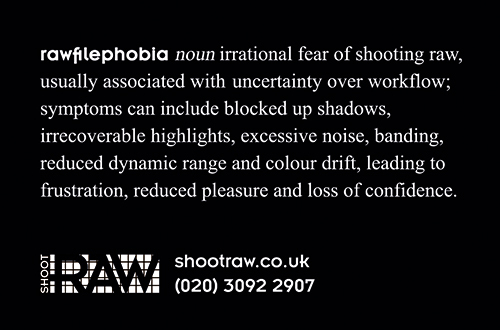 The unit was part of the new Digital Photography BA (Hons) course that Ravensbourne began this year. They’ve attracted a really good first-year cohort and the teaching was fun. It was also a good chance to see the way that a bunch of young photographers took to Lightroom 3 and to digital workflow in general. The blog updates that you’ll be reading over the next few weeks and months will have been inspired partly by seeing the result of a group of photographers work on things over a period of ten weeks — it highlighted things that I hadn’t seen when teaching individuals or shorter group courses. Photography degree courses are now beginning to really value the importance of digital asset management and workflow — that’s really good to know. As recently as 2010, we privately taught recent recent BA and MA graduates of photography who hadn’t touched Lightroom, Aperture or anything equivalent during their entire degree courses and who were processing their shoots very slowly. It’s good to know that the situation is changing — kudos to the folks at Ravensbourne for taking a fresh look at it and coming up with the a strong offering. It’s good to be a part of that change. Categories: Blog. Tags: Lightroom, News. Adobe Photoshop Lightroom 3 is out and, as you’d expect, it has almost all the features we’ve discussed previously—the much-improved image rendering and sharpening, the excellent noise-reduction routines, the lens distortion correction—and some that we haven’t, like tethered shooting, improved printing layouts and a much better slideshow module. 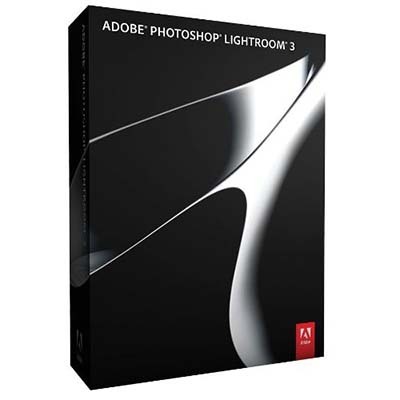 Amazon UK is taking pre-orders for the full version of Lightroom 3, the upgrade from version 2 and the full academic version and right now (9th June 2010), Amazon’s prices are excellent. If they fall further before the product ships, you’ll end up paying the lower price. 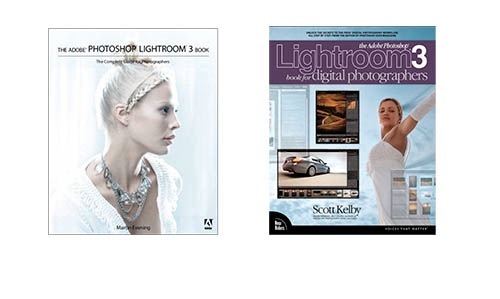 Remember: when you buy Lightroom, you get the Mac and Windows applications on the same disc. (However, Lightroom 3 won’t run on G4 or G5 Macs—it’s Intel only.) Adobe’s standard licence allows you to install and use the application on one desktop and one laptop, provided they’re not used simultaneously. 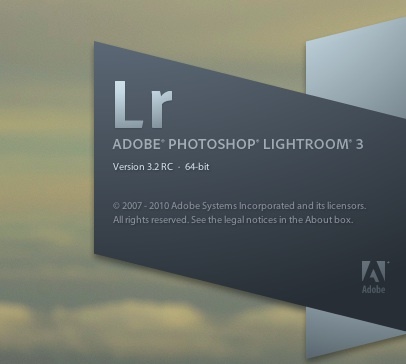 Until your copy of Lightroom 3 arrives, you can use the beta version (good till 30th June) or download a 30-day trial of Lightroom 3 from Adobe’s site. For US readers, here are the links on Amazon’s US store for the full version and the upgrade from version 2 . We notice as we deliver one-on-one tuition that photographers aren’t particularly interested in the regular Lightroom books that we always provide. One solution if you’re not keen on learning from books is video, so keep an eye on this page for the forthcoming Luminous Landscape Lightroom 3 training video by Michael Reichmann and Jeff Schewe. Michael’s an alpha tester for Adobe and Jeff works very closely with Adobe on product development and testing and their Lightroom 2 training (which we mentioned previously) is very good. 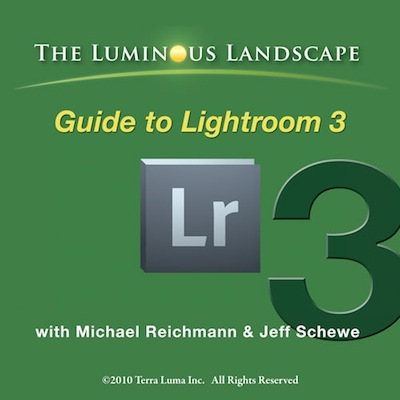 Expect the forthcoming Lightroom 3 edition to be insightful and informative. Lightroom 3 comes with a new Flickr plugin and a new export plugin framework that allows plugin programmers to create a richer user experience. Keep an eye on Jeffrey’s Friedl’s pages for details of what he offers and when he’s likely to update his excellent plugins for Lightroom 3 compatibility. He offers plugins for Facebook, Smugmug, Zenfolio and others (including a much more advanced Flickr plugin for Lightroom 3) and I believe he has been working with Adobe on the plugin architecture for Lightroom 3 itself. Read this post on Jeffrey’s site for more. Lightroom 3 will work just fine with Photoshop CS5 (obviously) but to get it to talk happily to the previous version, CS4, you’ll need to make sure your copy of the Adobe Camera Raw (ACR) plugin is at version 5.7 or later. Camera Raw is a free release—you just need to make sure your copy is current. The “Edit in Photoshop” function in Lightroom 3 will generally work as expected when you’re editing raw files in Lightroom 3 and sending to CS4 only if you install ACR 5.7. See an earlier post of ours for more information and for links to download ACR 5.7 for Windows and Mac OS X.
We’re planning our own training guide—something a little different from most of what’s out there. It will be based on the the questions we get asked from working photographers when we deliver follow-up training. After delivering training to enough working pros, you get to understand which things people struggle with and which come easily. You also get to learn which aspects of the raw workflow are most important to most commercial photographers—the results aren’t predictable. For our offering, we’ll be focusing on the key functions in a very simple, easy way. More on that later. Speaking of our own training, we’re getting quite busy (which is why you’re hearing less from us on this blog and e-mail list) but we’d still love to hear from you if you’d like to discuss one-on-one training, at your pace, on your own equipment. Professional, amateur, technical or non-technical—all are equally welcome. It’s better than learning from a book and it’s even better than learning from video. We’re now offer an afternoon-only option that allows you to spread the training over a week or two, in a few, short, sessions with plenty of time in between to practice. Although most of our customers are in and around London, we’ve trained photographers from Birmingham to Brighton; we’re getting quite good at minimising costs and expenses to deliver the best value. Wherever you are in the UK, call us on 0333 577 5703 to discuss training or, even better, complete our contact form and we’ll get back to you as soon as we can. To get to the contact form, click here. Categories: Blog. Tags: Lightroom, News, Photoshop, Software, Tips. The final version of Lightroom 3 (and ACR 6.1) will allow us access to lens-correction features that have long been lurking. For some compact cameras that shoot raw and for some Micro Four-Thirds camera-and-lens combinations, both Lightroom and ACR have been providing behind-the-scenes corrections of lens distortion. Users of the Canon S90, the Panasonic Lumix LX-3 and some wide-angle Micro Four-Thirds lenses (such as the excellent 20mm Panasonic f/1.7) have seen automatic correction of very significant barrel distortion but Lightroom 3 (and ACR 6.1) will extend that benefit, in some form, to the rest of us. Many users of the cameras and lenses mentioned above probably didn’t even know that their images were being corrected, sometimes for an eye-popping level of geometric distortion. The feature just worked, unbidden, behind the scenes. Adobe’s engineers generally seem to have matched the correction that the camera manufacturers applied to JPEGs generated by the camera and/or the results produced by the raw converters shipped with the cameras, meaning that by design, images from cameras like the S90 and LX-3 show some residual level of barrel distortion after automatic correction within Lightroom—correction over which the user has had no control, till now. With Lightroom 3, we’ll be able to fade the degree of correction for things like vignetting and distortion. Out of the box, the lens-correction feature will support some lenses from Canon, Nikon and Sigma (who even issued a press release about it) but potentially the strongest aspect of Adobe’s implementation is that we will get a mechanism to allow us to profile our own lenses for optical defects. There are other solutions to the lens-correction problem (DXO Optics Pro, for example, or PTLens) but Adobe’s looks like it might be the strongest so far for a couple of reasons: firstly, the existence of an easy way to profile your own lenses (the proof of the pudding will be in the tasting, of course) and secondly, the apparent concern of the Adobe Lightroom/ACR team to get local corrections working well with this new feature. This is harder than it sounds: say you’ve removed a spot of sensor dust from an image or you’ve added saturation and sharpness to a an area of a photograph: quite how should Lightroom react when you later switch on the automatic correction for lens for distortion? Should it even let you switch it on if you’ve applied local corrections? 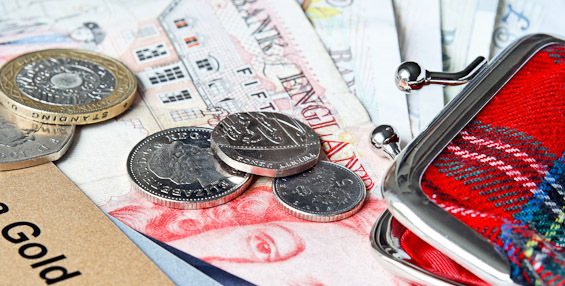 Head over to Tom Hogarty’s blog post, where he shows how it’s all going to work. Congratulations to the Lightroom team on what looks to be an excellent implementation. Categories: Blog. Tags: Lightroom, News, Software. 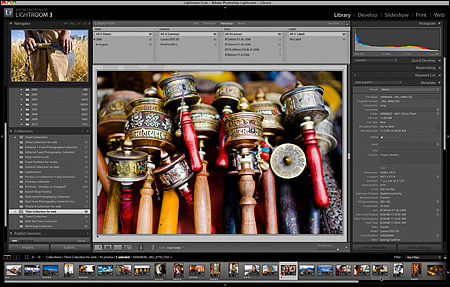 The free Lightroom 3 public beta was released in 2009 and was a big hit, particularly among low-light shooters, but the beta is due to expire at the end of April. Could it be that there’s a new version on the way before the final release? Take a look at this thread at the (usually very useful) Lightroom forum over at the Luminous Landscape. Apparently, there was an announcement that even made it to DP Review before being pulled. Perhaps by the time you read this, it’ll actually be out. This is the Adobe page to check. If there is another public beta on its way and if it offers a peek at the new luminance noise reduction that Adobe has been working on, it will be very welcome. We’re keen to see how the luminance NR compares with third-part solutions like Noiseware, Noise Ninja, Topaz Denoise and Neat Image. Categories: Blog. Tags: Beginner, News, Photoshop, Recommended, Software. Update 12th April 2010: the price of Elements is now back to normal. The offer lasted till 11th April 2010 so over three weeks in total. Still very good value but the prices mentioned below are no longer available from Amazon directly . The article will stay up since it provides some detail on using Elements with Lightroom. First, our apologies to the regular Photoshop users among you and to those of you outside Europe. You can skip the rest of this note. We don’t plan to do this sort of thing often but we received e-mail today from Amazon UK mentioning that it is now listing Photoshop Elements 8 at less than £50 as of 16 March 2010. That price includes VAT and shipping. This is the boxed, retail DVD and by UK standards, that price is an absolute bargain. (US readers who are still reading will raise their eyebrows at that description but sadly, it’s true.) The list price is £75 and it routinely sells on Amazon for £65. It comes as a Mac version (Intel processor only) or a Windows version and both are currently at the same price. Compared with most of the newer image editors intended for casual and occasional use, Elements wins hands down. It now offers layers, full Adobe Camera Raw compatibility, adjustment layers, and layer masks (for adjustment layers). It even offers smart sharpening and a version of the context-aware scaling function that you find in the full Photoshop (attempting to keep people and buildings in proportion while you stretch the image). Photoshop Elements will suit you if you don’t need to do much retouching outside Lightroom or Aperture but do need to clone out a stray object or element or if you need to run third-party noise-reduction plugins or something else requiring Photoshop. It will also suit you if you previously outsourced most of your own post-processing (or provided your clients and editors with images that weren’t retouched) and are only now beginning to do more of it yourself. It’s an excellent, low-cost way of beginning your Photoshop journey. For occasional use, Elements 8 has only three significant weaknesses compared with Photoshop 11 (CS4). It doesn’t allow you to convert to CMYK. (It’s also not a 64-bit application but neither is the full Mac version of Photoshop CS4.) Both LAB mode and the ability to work at 16-bit depth are useful but for many people who do most of their work (including local adjustments) in a raw converter like Lightroom or Aperture, these things might matter less than they once did. You’d convert to CMYK if you’re preparing press-ready work (for magazine or book adverts, say). Again, you’ll already know if you need it. If you ask nicely, many publications’ prepress folks will do the conversion from RGB to CMYK themselves if you provide them with tagged files that you produced in a colour managed workflow. If you have used Lightroom, Aperture or another raw converter to do most of the grunt-work, like exposure compensation, highlight recovery, tone, white balance, contrast, dodging and burning) on a raw file, you’ve done most the things that would cause problems with 8-bit files. Performing some further minor work (some cloning or healing in small areas) on an 8-bit file is not usually something to worry about. Above: setting up Lightroom to work with Elements 8 for work that will remain in 16-bit throughout. Lightroom integration with Photoshop CS4 is deeper than with other image editors like Elements. However, Elements offers most of what you need: in Lightroom’s preferences, perform a one-time setup. You specify that Elements 8 is your image editor, you tell Lightroom which colour space to use when creating an export file and which format to and bit depth to work at. Once you’ve set it up once, you’ll have a keyboard shortcut (for example, command-option-E or ctrl-alt-E) to invoke Elements but you can also right-click an image inside Lightroom and edit in Elements that way. Because it’s set up, the bit depth, file type and colour space will be taken care of automatically after that. Lightroom also allows you to set up Elements 8 in different ways (16-bit TIFF, ProPhoto, 8-bit TIFF sRGB) so that you get a choice of options for each image that you send to Elements: you would choose the most appropriate for the task at hand. Above: examples of what you might see when you right-click an image in Lightroom having set up different ways of sending an image to Elements 8. What you don’t get with Elements 8, compared with CS4, is the smart objects integration, the HDR-from-raw-files integration and the ability to create panoramas from your raw shots. If you were using Photoshop Elements to run a noise-reduction filter like Neat Image or Topaz Denoise, you’d choose to work with 16-bit TIFFs in something like Adobe RGB space. Lightroom will create a TIFF that contains all your existing Lightroom edits and will send it to Elements. When you finish and save your work in Elements, you’ll see the edited file in Lightroom, next to the original. 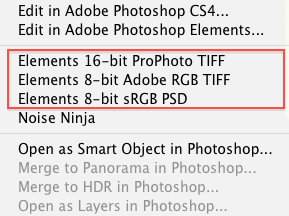 Lightroom will handle the 16-bit TIFF as it would any other file, allowing you to export JPEGs, print, etc. We own and use both CS4 and Elements 8 (for which we paid a good deal more than £49!) here at Shoot Raw, just to make sure we keep up-to-date with both. We can recommend Elements 8 for photographers who don’t spend a huge amount of time doing advanced Photoshop work or for people beginning with Photoshop, who’d like to get familiar with the application. 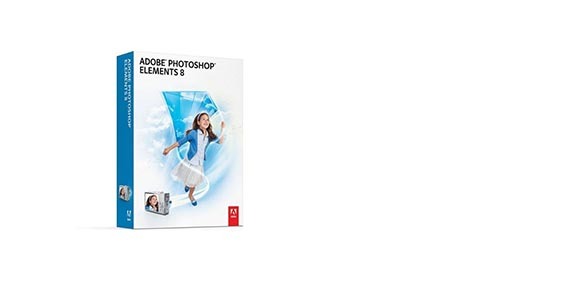 One more thing: if you were to buy Elements at £49 and then upgrade to Photoshop CS4 today at the Adobe UK site, you’d end up saving £30 over the cost of just buying CS4 outright from Adobe. Though it’s impossible to say this with absolute certainty, that saving is likely to continue when CS5 is released. Amazon UK is marking this is “for a limited time only”. No idea how long it’ll last. We’ll try to update or delete this note when the offer has gone. We’re going to start a series of articles looking at exactly which camera settings affect the data in your raw files when you work with Lightroom and how. We’ll be looking at the primary exposure controls—shutter speed, aperture, ISO—and secondary camera settings like saturation, sharpness, contrast and colour mode (meaning options like Adobe RGB and sRGB). Over the series, we’ll be giving you definitive answers and explaining the technical language. If you were sent a link to this post, you can subscribe by e-mail or RSS to receive all future articles in full. It’s free. Unlike many stories about the importance of backup, this one has a happy ending. Matt Kloskowski, of Lightroom Killer Tips, is teaching at Gulf Photo Plus in Dubai and found that a cloned copy of his MacBook drive, Fedex’d from the US, reached him just in time for him to be able to teach his first class after his internal drive failed. Read Matt’s story here and if you need to, you can remind yourself of our recommended Lightroom backup strategy. Though it’s usually John Harrington or Dan Heller making the running in this area, it’s worth keeping up with Photoshelter’s information on running a photography business. They talk about SEO, workflow, licensing, selling and more. Obviously, they’re trying to sell you Photoshelter accounts (not a bad thing—we’ve used Photoshelter and might cover their services in a future article) but the information is good in its own right. What people say they want isn’t always reliable—we know that. There’s a Nikon story that says when the company surveyed its professional customers about an emerging technology called autofocus a couple of decades back, it learned that pros couldn’t care less about it. Hindsight reminds us that autofocus happened to be a bit slow and rubbish at the time. Perhaps it’s not surprising today, then, to learn that when other companies took the idea seriously and released decent autofocus systems, Nikon quickly lost a bushel or two of market share. The company had believed its survey results and hadn’t taken the idea of autofocus seriously enough. I don’t think the pros who answered the survey were lying: they really believed that they didn’t want autofocus and they just happened to be wrong. Henry Ford is famously quoted as saying that if he’d asked his potential customers what they wanted, they’d have asked for a faster horse. You get the idea. Above: an excerpt from the Photoshelter 2009 Buyers’ Survey. If the survey page whets your appetite, there’s also a presentation of the buyers’ survey results in an hour-long movie. Its glacial pace makes it a little frustrating at times but there is actually some very useful information in there. If you’re just about to build a site or overhaul one and you make sales online (or hope to), it’s definitely worth the hour spent. There’s a very good article from the inestimable Ctein about what tests don’t tell you, published on Mike Johnston’s outstanding site The Online Photographer. Ctein provides an example of how banding (which you see often see in high-ISO work, especially when you push a low-light exposure) is rarely reflected in the noise measurements of digital cameras that you see online, even though it’s a form of noise. He uses it as just one example of how tests can be incomplete. The comments that follow the article are just as relevant, too. Ctein is a wizard, famous for his dye transfer prints, among other things. Even his regular small inkjet prints (we have a couple in the form of some Christmas cards that he mailed to his supporters last year) are something special. Kodak once called him the world’s best printer and I can believe it. 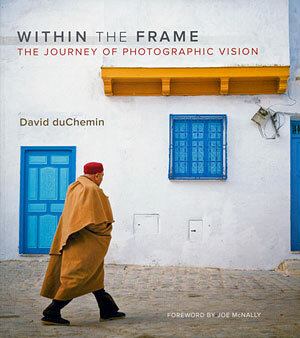 Photographer David duChemin is the writer and photographer of a very warm, uplifting book called Within the Frame (Amazon US , Amazon UK ), a book of travel photography and the author’s approach to it. Last week, David published on his blog a piece called Confessions of a So-Called Pro to help put all the technical stuff into context and remind us what’s really important about photography. I often leave my ISO dangerously high. I get more email about why I shot something at ISO 800 than anything else and that tells me (a) I should get my act together and (b) y’all need to lighten up on the whole ISO issue. Thanks to our friend Danny De Vylder, who sent us our copy of Within the Frame last year and introduced us to David’s work.